First you need to make sure that you are choosing the right website platform to build your hotel website. A self-hosted WordPress.org site gives you the freedom and tons of customization options. Next, you will need to sign up for web hosting. All websites need hosting, this will be your website’s home on the internet. You will also need a domain name. This will be your website’s address, and this is what users will type in their browser to reach your website. Once you have signed up for hosting, the next step is to install WordPress. After installing WordPress, you can select a theme from our expert pick of the best WordPress hotel themes. Need help installing the theme? Contact me. Having said that, let’s take a look at some of the best WordPress hotel themes. This list contains both free and paid WordPress themes and all of them are fully mobile responsive. SixtyOne is a beautiful premium WordPress theme for hotels. It comes with a built-in booking request form and a highly customizable homepage layout. The homepage features a large slider followed by a call to action. It has sections to easily add galleries and a full hotel room management system. Visitors can easily select dates and check for room availability directly from the homepage. It also comes with custom widgets for social media accounts and page templates for room, room category, gallery listing templates, custom contact, location and booking pages. 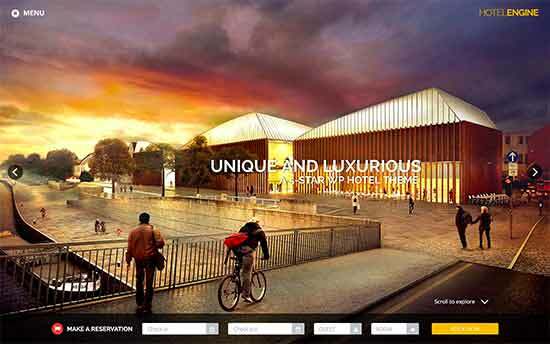 Bordeaux is a highly customizable WordPress hotel theme. It has an easy to setup homepage layout and comes with live theme customizer support, which allows you to easily customize theme settings with a live preview. It comes with a gorgeous homepage slider with call to action button, contact form, and multiple page templates. Marea is a WordPress theme designed specifically for hotels, motels, and travel websites. It features a large homepage slider with call to action buttons. It is easy to set up with live customizer and allows you to choose your own colors and fonts. It comes with beautiful photo galleries and tons of shortcodes to easily add elements into your WordPress pages. It supports all popular third-party booking platforms. Sun Resort is an elegant and easy to use WordPress hotel theme. It comes with a beautiful homepage layout featuring a large slider with call to action buttons. It has a built-in booking form that allows your visitors to easily request bookings directly from your website. It comes with multiple content types to easily add rooms, galleries, attractions, videos, testimonials, and services. It has a drag and drop home builder that lets you easily display these sections on the front page. Welcome Inn is a versatile WordPress theme for hotels, resorts, bed and breakfast, and vacation rentals. It comes in three different flavors. A modern hotel template, a Ski Resort template, and a beauty spa template. It comes with a built-in reservation form, sliders, contact form, and multilingual support. Imperial is another WordPress theme designed specifically for hotel websites. It comes with built-in templates to add portfolio, gallery, and testimonial pages. It comes with a social media menu, custom fonts, and unlimited color choices. Santorini Resort is a WordPress theme for hotels, resorts, rentals, guest houses, etc. It comes with a built-in booking form and a room management system. The homepage features a large slider with call to action button. It comes with sections to easily add rooms, galleries, attractions, video, testimonials and services. The homepage layout is easy to setup and it comes with tons of customization options. Arcadia is modern WordPress theme for hotels, motels, and travel websites. It features a large fullscreen slider, custom backgrounds, custom headers, and tons of customization option. You can easily set up theme using the live customizer and create your own unique color schemes. It comes with a built-in booking form template and you can also easily integrate third-party tools to handle bookings. It has custom widgets for social media integration and multiple page templates for different sections of your website. HotelEngine Classy is a powerful and highly customizable WordPress theme for hotels, resorts, and hospitality websites. The front page features a beautiful fullscreen slider with a booking form at the bottom of the screen. It comes with room templates, services, location, and gallery templates. It also has testimonials, custom logo, multiple color schemes, and east to use theme options panel. Voyage is a feature-rich WordPress theme for travel websites, hotels, tour operators, etc. It has wide and large slider on the front page. A booking form module, customizable layout providing excellent user experience on all devices. Voyage also has a powerful search and filter feature allowing your users to quickly find results they want. It comes with a powerful theme options panel which makes it easy to manage and set up. Palermo is an elegantly designed WordPress hotel theme. It features a two column layout with a sticky sidebar and a fullscreen background. You can use a single image or a slider as your background. It comes with rooms, galleries, restaurant, and direction page templates. It has a room management system where you can easily add rooms with their facilities, rates, photos, and descriptions. It also has a built-in testimonials section, contact form, attractions, and blog section. Imperial is a beautiful WordPress theme for hotels with a two-column fixed sidebar layout. It comes with ready to use templates for pages like attractions, testimonials, image galleries, rooms and rates, accommodation, etc. It has a separate page for blog section, a homepage, and a robust theme’s options panel. Olympus is another modern WordPress hotel theme for resorts, hotels, vacation rentals, etc. It features a beautiful large homepage slider with a booking form overlay and call to action button. It comes with tons of customization options and has sections to easily add rooms, attractions, galleries, testimonials, etc. The homepage layout is easy to setup with a drag and drop layout builder. HotelEngine Comfy is a beautifully crafted WordPress theme for hotels. It has a built-in hotel room booking form and rooms management section. It comes with beautiful image galleries and sliders allowing you to add photos of your rooms as well as nearby attractions. It has multiple color schemes, custom widgets, and a powerful theme options panel. Prestige is a beautifully designed WordPress theme for hotels, motels, hospitality and travel related websites. It allows you to easily build your homepage layout using custom widgets in live customizer. You can also change fonts colors to create your own unique styles. Prestige comes with social media integration, custom widgets, sliders, and custom backgrounds. It also has multiple page templates for different sections of your website. Zermatt is a stunningly beautiful WordPress theme for hotels, hostels, rental homes, and vacation houses. It features a fullscreen homepage slider with call to action button. It comes with a built-in booking form and rooms section. 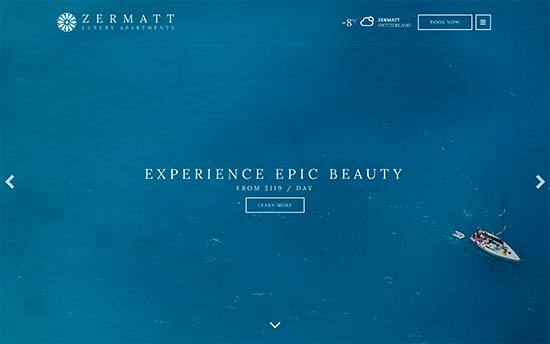 Zermatt comes with lots of customization option that allow you to truly customize the theme. It has many custom widgets for social media, booking form, galleries, etc. It also comes with a drag and drop homepage layout builder. 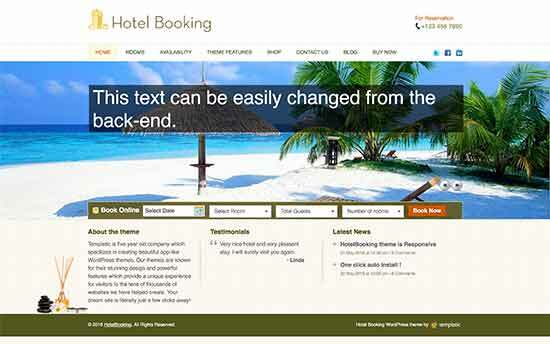 HotelBooking theme for WordPress hotel websites comes with a built-in room booking system. It has widgetized homepage, which means you can drag and drop widgets to create your own homepage layout. It is packed with features that hotel website might need such as a services section, event calendar, multilingual support, promotional prices, etc. Philoxenia is a stylish WordPress hotel theme featuring a gorgeous design with beautiful colors. In terms of functionality, you get a fully functional booking form, a room management system, beautiful image galleries, videos, etc. The theme setup is quite easy with drag and drop homepage layout and theme options panel. It comes in with multiple color schemes and has custom page templates and custom widgets. Woods Hotel is a premium WordPress hotel theme with built-in booking and room management system. You can easily add rooms, facilities, extras, image galleries, to create a beautiful user experience on your site. It also comes with a restaurant menu management section where you can add menu items, prices, etc. It comes with a drag and drop page builder with multiple layout choices and content modules to add. Travel Stories is an elegant WordPress theme for travel, tourism, and hotel websites. The main feature of the theme is its homepage which uses large images in a grid layout with a large header on top with call to action. It works with all popular third party booking services and comes with live theme customizer support. Hotel is a free WordPress theme for hotels, travel websites, bed and breakfast, etc. It features a classic two column layout with large featured images. It works well with third-party booking plugins and WordPress form builder plugins. It also works with all the popular gallery plugins, sliders, and Google Maps plugins. Allowing you to build your hotel website using plugins without relying on theme. This gorgeous WordPress hotel theme comes with a beautiful slider and parallax background on the homepage. It comes with a rooms template, services section, and 80+ shortcodes to add quick functionality anywhere in your post and pages. It also supports WPML and comes in multiple color schemes. Hotel is a gorgeous WordPress hotel theme with parallax scrolling on the homepage. It comes with easy to manage sections for services, testimonials, staff, and portfolio. It also integrates Google Maps beautifully to show your hotel location on a large map. It also comes with beautiful image galleries with multiple layout choices. Aegean is a stylish WordPress theme for hotels, resorts and travel websites. It comes with a booking form and a large slider on the front page. You can easily integrate a third party booking system as well. It has beautiful template for galleries, multiple layout choices, multiple sidebars and widget ready areas. It also comes packed with shortcodes allowing you to easily add design elements such as color boxes, accordions, call of action buttons to your landing pages using simple shortcodes. 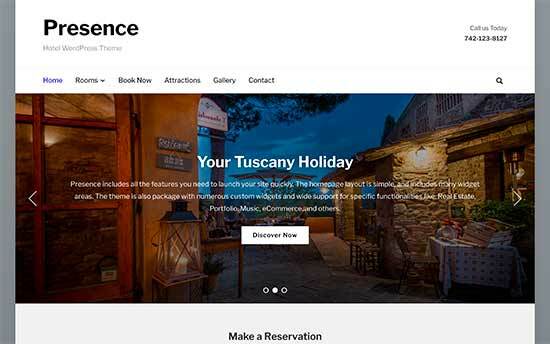 Presence is a multi-purpose WordPress theme which is ideal for hotels, travel and tourism websites. This flexible WordPress theme comes with multiple page layouts. It has 10 demo website templates including a hotel website demo. It is compatible with third-party room booking systems. It also comes with a page builder, beautiful image galleries, and a testimonials section. HotelMotel is a modern, stylish, fully-responsive WordPress theme for hotels and accommodation websites. It comes with multiple color choices, a built-in booking form which can be replaced by a third party booking system if you want. It also comes with unlimited sliders, slideshows, featured image support, shortcodes, and many other features. Locales is a powerful WordPress directory theme for travel, tourism, and hotel websites. It comes with a built-in directory component allowing you to list hotels, shops, restaurants, cafes, and other nearby attractions. It comes with a gorgeous display of listings on the frontpage in a grid layout with large images. It has tons of customization options and comes with demo data that you can import to quickly get started.